The non-invasive LVUN-600 Series monitors liquid levels at 1 or more points through pipes or tubing of various sizes, from 6.4 mm (0.25") diameter tubing to 152.4 mm (6") diameter pipe, with a wall thickness of up to 0.5". 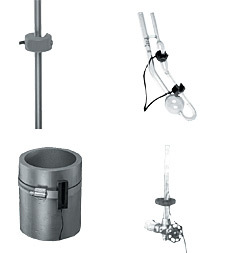 The sensor simply clamps on the thick-wall pipe or tube; no alignment is necessary. The sensor is small, allowing mounting at almost any location, without interrupting the process or requiring the modification of the pipe or vessel. It is ideal for high-pressure, thick-wall tubing pipes or sight glasses. The LVUN-600 Series can handle a variety of liquid types–from heavy to light. It uses ultrasonic sound wave propagation to generate electrical signals that are converted to bursts of ultrasonic energy. The ultrasonic bursts are transmitted across the liquid sensing gap of the sensor. Upon receipt of a valid signal at the receiver, the solid state electronics generate a "data enable" condition indicating that liquid is present. This signal energizes a relay, triggering an output condition. Custom configurations are no longer available.